There are some great travel deals popping up where you can getaway for cheap and have a fun weekend. Some may be a few hours away from a major city and others might be a plane ride. Whatever you decide to do, if your dog is going to go with you, it’s important to plan a trip that will be fun for both of you. Sure, you could board your dog or ask a friend to watch her/him but your dog could probably use a break too. Mutt Lynch Winery – Located in Sonoma County in California, this winery’s name is whimsical and also a great place to taste some exquisite wines. The winery supports and donates money to various dog rescue groups, and their motto is, “Bark less, wag more!” You could start the day off with a long walk, some play time, and then head to winery while your pup snoozes. Then both of you can play dead together in the evening. The beach in Key West – Key West, Fl is known for its nightlife, sunshine, and great food. It’s also dog-friendly. There is a great beach that allows dogs to run around off-leash on Vernon St. and Waddell Ave. After you’re done splashing around, head over to Louie’s Backyard and catch a drink. There is even a kayak rental place that allows dogs to paddle with you. Sun, fun, drinks, and lots of tail wags. Sounds perfect. Colorado Springs – one coolest places to visit with its mountain scenery, trails, and dog parks, this is a pet paradise. Buckskin Joe Frontier Town and Railway allows pets go where you go, on a horse-drawn trolley into town or on the train ride. Cripple Creek District Museum, Garden of the Gods Trading Post, Historic Manitou Springs and Manitou Cliff Dwelling all allows pets as long as they are well-behaved and leashed. 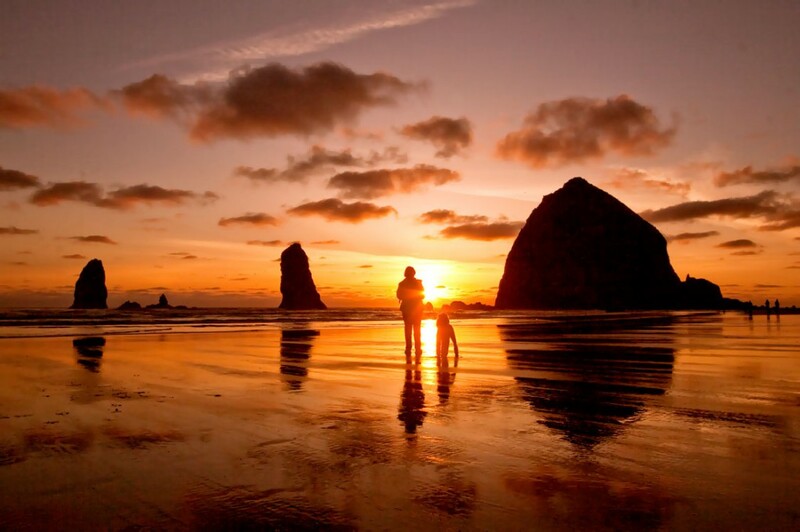 Cannon Beach, Or – With over 14 pet-friendly hotels in the area, lots of awesome places to eat, as at least 10 restaurants that allow dogs to dine with their owners at outdoor tables, this is the best place for a weekend getaway if you live near Portland, Or. The highlight, though, will definitely be walking the miles of beaches, which allow dogs to go leash-less as long as they’re under voice control. Acadia National Park – Acadia National Park has over 120 miles of hiking trails that range from easy to strenuous. Imagine the smell of the deep woods, beautiful shorelines, and peacefulness you’ll feel there. Your dog will love exploring the trails and sniffing everything! Please remember, dogs must be leashed on trails and bring bags to clean up after your dog. Montrose Beach, Chicago – When I say Chicago in my head, I imagine cityscapes and buildings. I don’t think about a beach being so close but there is an amazing beach where you and your pup can roam and swim off-leash. After playing and shaking the sand out of your ears, catch a drink and some good food at one of the many outdoor restaurants that allow pets to hang out with you. No matter where you go, make sure your pet has updated identification tags and don’t forget to make a list of the emergency vets in the area you’re staying just in case. Have fun and send us pictures!